After outrage over his failure to hold Russia accountable for interfering in the 2016 U.S. election during a meeting with President Vladimir Putin, U.S. President Donald Trump said Tuesday that he accepts the U.S. intelligence community's conclusion that Russia did in fact meddle in the election. But even as he tried to clarify the statements he made at a joint news conference with Putin in Helsinki on Monday and assert support for U.S. intelligence agencies, he left room for other actors to be implicated. "I accept our intelligence community's conclusion that Russia's meddling in the 2016 election took place," Trump said. "It could be other people also — there's a lot of people out there. There was no collusion at all." At the Monday news conference, which followed a two-hour, closed-door meeting with Putin, Trump stunned politicians back home by shying away from criticizing Putin for Moscow's efforts to undermine the election, contradicting the findings of American intelligence agencies. Trump, whose summit with Putin concluded a week-long European trip that included a NATO meeting and talks with British Prime Minister Theresa May, pushed back on Tuesday at the storm of criticism, blaming media coverage. Trump, who had the opportunity to publicly rebuke Putin during the news conference in Helsinki, instead praised the Russian leader for his "strong and powerful" denial of the conclusions of U.S. intelligence agencies that the Russian state meddled in the election. Standing alongside Putin, Trump told reporters he was not convinced it was Moscow. "I don't see any reason why it would be," Trump said. Despite a televised interview on Monday and numerous postings to Twitter, Trump did not correct himself until 27 hours later. 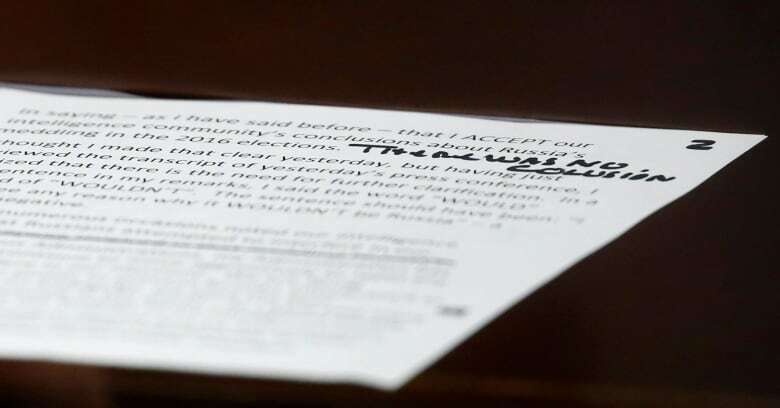 Back at the White House Tuesday, he told reporters that he meant to say wouldn't instead of would. He told reporters: "The sentence should have been I don't see any reason why it wouldn't be Russia." Would or wouldn't? Watch Trump's explanation that he misspoke in Helsinki. As the president said he has "full faith" in the intelligence agencies, the lights in the conference room briefly went out. As they came back on, he said that while he feels strongly that Russia's actions had no impact on the outcome of the election, he accepts the intelligence community's conclusion that meddling took place. The president also said his administration would repel any effort to interfere in the upcoming midterm elections. The condemnation for his performance at the Helsinki news conference — including from many fellow Republicans — matched or eclipsed previous controversies in Trump's turbulent 18 months in office. "The president needs to understand he has damaged U.S. foreign policy," Rep. Mike Turner, a Republican on the House intelligence committee, told CNN. "He's given them a pass and is certainly not holding them accountable for what they're doing." Senate majority leader Mitch McConnell addressed the issue Tuesday, saying it is "indisputable" that Russia meddled in 2016. "I think the Russians need to know that there are a lot of us who fully understand what happened in 2016 and it really better not happen again in 2018," the Republican leader said. Trump also reiterated Tuesday his message that he thinks the U.S. and Russia should work to improve relations and said that "diplomacy and engagement" is better than hostility and conflict. Ahead of Trump's appearance, some lawmakers said they would seek remedies in Congress. Republican Sen. Jeff Flake, a longtime Trump critic, has raised the idea of passing a resolution that would voice lawmakers' support for the U.S. intelligence community and U.S. allies. Robert Menendez, the top Democrat on the Senate foreign relations panel, has floated a resolution similar to Flake's. Several senators, including Republican Ben Sasse, Republican Pat Toomey, Senate Democratic leader Chuck Schumer and Mark Warner, the senior Democrat on the Senate intelligence panel, have backed more sanctions on Russia. But it was unclear whether Senate or House of Representatives leaders would support such a move or how new sanctions might be crafted. House Speaker Paul Ryan, calling Russia's government "menacing," said he was willing to consider additional sanctions on Russia, and reiterated his support for U.S. intelligence community findings that Russia interfered in the 2016 election. "We just conducted a yearlong investigation into Russia's interference in our elections," he said. "They did interfere in our elections — it's really clear. There should be no doubt about that." Ryan said Putin "does not share our interests … does not share our values." Watch Paul Ryan comment on Russian meddling in 2016. Congress nearly unanimously passed a sanctions law last year targeting Moscow for election meddling and for its actions in Ukraine and Syria. In April, that law led the U.S. Treasury to impose major sanctions on Russian officials and oligarchs, in one of Washington's most aggressive moves to punish Moscow. 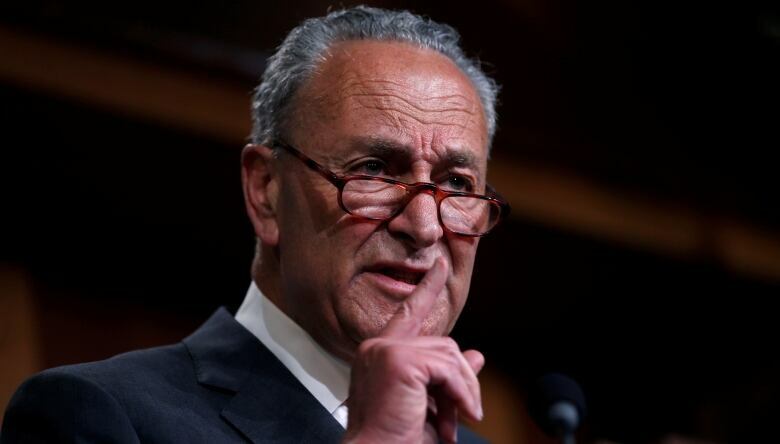 Schumer also called for the immediate passage of legislation to enhance election security, and reiterated calls for the Senate to hold immediate hearings to get testimony from Trump's national security team about what transpired during the private Trump-Putin meeting "so we can find out what the heck happened there." After the president addressed the Russia issue on Tuesday, Schumer said Trump "made a horrible statement, tried to back off, but couldn't even bring himself to back off." "It shows the weakness of President Trump that he is afraid to confront Mr. Putin directly," the leading Democrat said. U.S. intelligence agencies concluded last year that the Russian government interfered in the 2016 election campaign and sought to tilt the vote in Trump's favour, something Moscow has long denied. Special counsel Robert Mueller is probing that allegation and any possible collusion by Trump's campaign. Trump has denied collusion and casts Mueller's probe as a witch hunt that detracts from his election victory. House Democratic leader Nancy Pelosi on Tuesday called for passage of legislation increasing funding to improve the security of U.S. election equipment and prevent cyberattacks. Pelosi also wants to force a vote on the House floor on a resolution rebuking Trump's remarks in Helsinki. Other lawmakers called for members of the Trump administration to resign in protest. Not all Republicans were angry with the president's conduct in Helsinki. "The president did a good thing by meeting with Putin," Sen. Rand Paul told the CBS program This Morning, comments that won him public thanks from Trump on Twitter. Russia's political and media establishment heralded the summit as a victory for Putin in breaking down Western resolve to treat Russia as a pariah. See more of Trump's Tuesday afternoon news conference, where he addressed his Russia comments.